What is that common resource between Olympic and NBA champions, sports athletes such Usain Bolt, Michael Phelps, Lebron James and successful businessmen and entrepreneurs (Bill Gates), actors (Leonardo Di Caprio), singers (Paula Abdhul), politicians (Bill Clinton) and many many other successful individuals or teams? All of them have a personal or a team coach for transforming them individually or their team towards excellence in their area in a way that wouldn’t be possible with any other means or it would have taken a lot of time! In the corporate environment, 10 years ago, coaching was mainly directed at talented executives who were likely to be fired if something didn’t change. Today, coaching is a popular and potent solution for ensuring top performance from an organization’s most critical talents. This kind of coaching became popular especially over the past five years because companies faced a shortage of talent and were concerned about turnover among key employees. As coaching has become more common, any stigma attached to receiving it at the individual or team level has disappeared. Now, it is often considered a badge of honour! The fact that around 11 billion € are spent annually in failed proposals as I have shown in my previous article “Why you cannot afford to fail and how to succeed in european funding” shows that organisations, teams and individuals should get coached immediately on exploiting successfully european funds. Experience has shown also that most of the proposals are developed by young individuals that may lack the experience or the talent to develop winning grant applications. 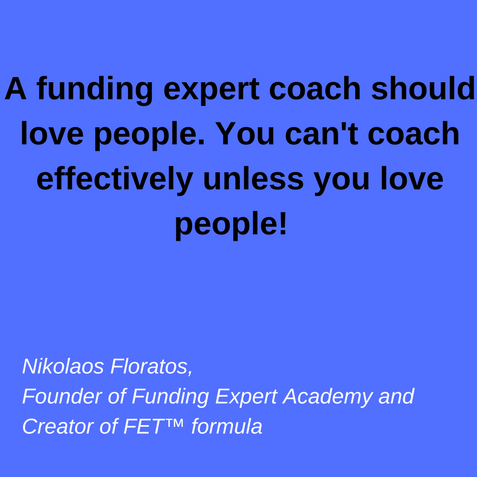 The above makes it now more imperative than ever for organisations and individuals to consider coaching as the key resource for exceptional and rapid success in exploiting european and state funds. 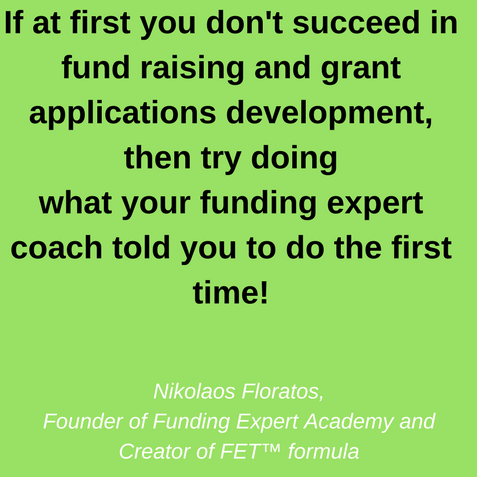 In the video below, I outline the key elements for coaching in european funding and why it is the most effective way for quick and permanent successful results. 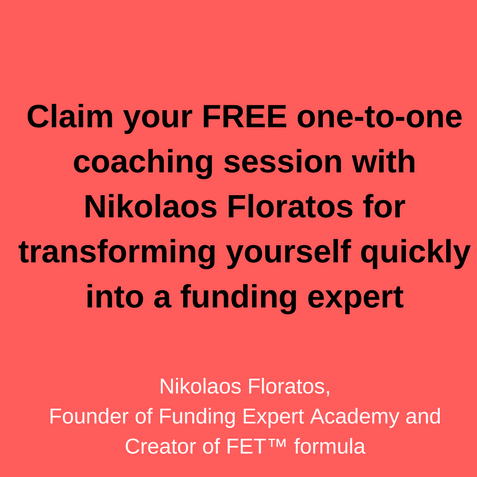 Most importantly take advantage of the following exclusive invite: Claim your FREE one-to-one coaching session with Nikolaos Floratos. Don’t settle for mediocracy or for long term results. 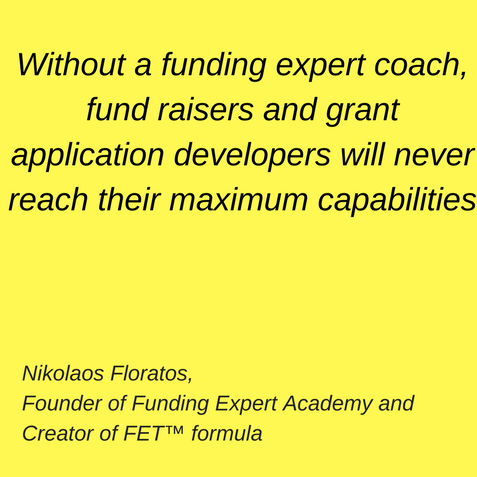 Sign-up for my FREE one-to-one (just me and you) coaching session and see for yourself the impact me as funding expert and coach can make on your performance as fund-raiser and grant application developer. Join also our facebook group”Funding Experts with value” for sharing views, challenges, solutions as well as further training ideas on my future videos.